- WWF No Way Out '01 = The Brothers of Destruction lost a "Three-Way Tables" match to the WWF Tag Champs, the Dudley Boyz. Edge & Christian were the other participants. - WWF Backlash '01 = The Brothers of Destruction lost the WWF Tag-Team Titles to Heavyweight Champion Steve Austin & Intercontinental Champion Hunter Hearst Helmsley. All three titles were on the line. - OVW "The Last Dance" (June 27, '01) = The Brothers of Destruction won, via DQ, over Diamond Dallas Page & Leviathon. - WWF Invasion (July '01) = The Brothers of Destruction, Steve Austin, Kurt Angle, & Chris Jericho lost to the ECWCW team of Booker T, Diamond Dallas Page, Rhyno, & the Dudley Boyz. - WWF Summerslam '01 = The Brothers of Destruction won a "Titles-vs-Titles Cage" match over Diamond Dallas Page & Kanyon, unifying the WWF and WCW World Tag-Team Titles. 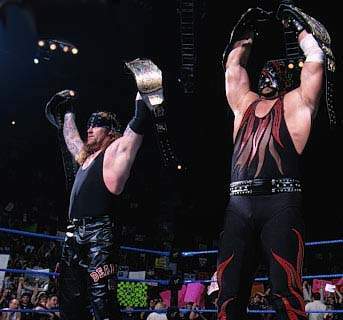 - WWF Unforgiven '01 = The Brothers of Destruction retained the WCW World Tag-Team Titles, beating Kronik. - WWF Survivor Series '01 = The Brothers of Destruction, the Rock, Chris Jericho, & the Big Show won an "Elimination" match over Steve Austin, Kurt Angle, Shane McMahon, Rob Van Dam, & Booker T.